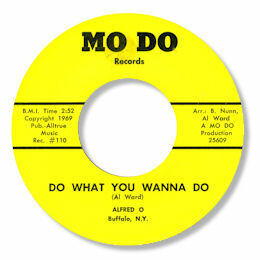 The tiny Mo Do label was started by Buffalo, NY resident William Nunn and recordings were made in his home basement studio. Nunn was ably assisted by his son Bobby, one half of the Bob & Gene duo, who provided engineering, writing and musical help on most of the label’s output. Aside from Bob & Gene, other artists came from the local neighbourhood and Nunn was adamant about the need for his efforts to have a firm community base and involvement. Among the guys who called in was Alfred Ward who brought along his own Do What You Wanna Do ballad with him. The chord changes are in the classic mould as is the splendidly haphazard arrangement – fantastic horns especially the prominent trumpet. Alfred rises above all this rather well with some delicious falsetto touches and you can just hear the odd girl singer or two occasionally. This should be much better known.